Users of high-performance data acquisition and signal processing boards often find themselves frustrated by the fact that when their new devices are delivered, they are unable to put them to immediate use. Because these boards are largely software controlled and offer a flexible range of functionality, a certain amount of programming is generally necessary to put the new cards through their paces. Then, if something does not go as planned, there is no way of knowing for sure whether the problem lies with the new code, or with the hardware itself. The SPARK® family are fully-integrated development systems for Pentek's software-defined radio (SDR) and data acquisition and I/O boards. The SPARK series was created to save engineers and system integrators the time and expense associated with building and testing a development system that ensures optimum performance of Pentek boards. The package contains C-language examples that can be used to demonstrate the capabilities of Pentek products. The examples included provide the answers to most of the questions that occur with firsttime users of Pentek products. These programming examples will also help you get an immediate start on writing your own application without having to reinvent the wheel. They provide sample code that is known to work, giving you, the new user, a means of verifying that your board set is operational. ReadyFlow® Board Support Packages are designed to reduce development time not only during the initial stages, but any time new hardware is added to the system. All packages are built with a consistent style and function-naming convention. Similar parameters on different boards have similar function calls, thereby allowing immediate familiarity with new hardware as it's added further shortening the learning curve. The Command Line Interface provides access to precompiled executable examples that operate the hardware right out of the box, without the need to write any code. Board-specific hardware operating arguments can be entered in the command line to control the following parameters: number of channels to enable, sample clock frequency, data transfer size, data rate divider, interpolation factor, reference clock frequency, reference clock source, number of iterations to run the program, etc. The Command Line Interface can be used to call an example application from within a larger user application to control the hardware, and parameter arguments are passed to the application for execution. Functions that control data acquisition, automatically save captured data to a prenamed host file or are routed to the Signal Analyzer example function for display. When used with the Command Line Interface, the Signal Analyzer allows users to immediately start acquiring and displaying A/D data. 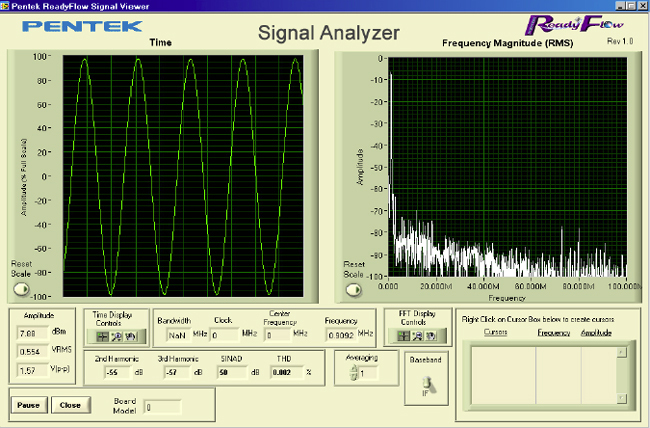 A full-featured analysis tool, the Signal Analyzer displays data in time and frequency domains. Built-in measurement functions display 2nd and 3rd harmonics, THD (total harmonic distortion), and SINAD (signal to noise and distortion). Interactive cursors allow users to mark data points and instantly calculate amplitude and frequency of displayed signals. * Signal Analyzer and Command Line Interface supported on Cobalt series boards for both Windows and Linux. The Pentek's Board Support Packages (BSP) are designed to reduce development time not only during the initial stages of software development, but any time new I/O hardware is added to the system. Hardware Drivers, each designed to control the specific hardware features of the I/O interface being used, are built with a consistent style and function naming convention. Similar parameters on different I/O modules have similar driver calls, thereby allowing immediate familiarity with new I/O hardware as it's added. This can greatly shorten the application development learning curve when a system is modified or expanded. The Pentek ReadyFlow BSPs for Linux, Windows and VxWorks provide developers with a complete library of hardware initialization, control and application functions for Pentek's processor baseboards and modules. The BSPs include C-language device libraries as well as high-level APIs and programming examples to speed application development, and to allow developers the level of hardware access appropriate for their specific application.